The story takes place 1000 years after the war called "Seven Days of Fire". Bioengineered weapons, the giant God Warriors, have completely burned the entire earth down and destroyed the ecosystem and human civilization. The earth is now covered by ruins and poisonous forests, and the remaining humans have only retained fragments of the ancient technologies. They now live in a world much like the Medieval Ages. A small country with a population of 500. It is located on the edge of the Sea of Corruption, but the constant clean wind from the sea protects the Valley from miasma and spores, thus keeping the Sea of Corruption from creeping into the Valley. Therefore, the wind is worshipped by people of the valley, and the most important duty for the chieftain is to read and utilize the wind to protect the Valley. The Valley is recognized as a dominion by Torumekia. In return, it has to join the Torumekian forces if Torumekia goes to war. The heroine of the manga. The Princess of the Valley of Wind. She is clever, resourceful, and a skilled swordswoman. She is a windrider, who can read and utilize the wind well, and flies a "Mehve", a glider with an engine. She has an empathetic ability and can even communicate with insects from the Sea of Corruption. As a next chieftain of the Valley, she joins Kushana's army, but the gruesome reality of the war devastates her. She desperately tries to stop mass killing and suffering, and her quest for the truth leads her to the most unimaginable places, and to the biggest secret of the world. Nausicaä's father and the Chieftain of the Valley of Wind. He is now totally invalid due to disease caused by the poison from the Sea of Corruption. Nausicaä's teacher and legendary swordsman. He's been traveling the world in search of the secret of the Sea of Corruption. One of "Castle Uncles". Loyal to Nausicaä and co-pilots the Valley's Gunship. A fox squirrel. Nausicaä's loyal friend. Yupa's Toriuma (Horseclaws). Kai was given to Nausicaä as a mount before she left for the war. The diatryma, now extinct, was undoubtedly Miyazaki's inspiration for horseclaws. Information from Encyclopaedia Britannica. A Diatryma skeleton "in motion." 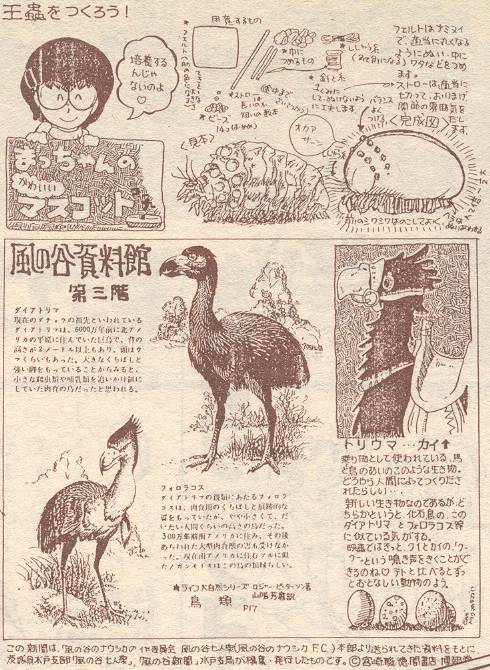 Reference in Animage 1984/2 page 188. A large militaristic kingdom located to the east of the Sea of Corruption. The capital is Tolas. It is in alliance with small boarder countries, such as the Valley of Wind. It wages a war against Dorok, and demands its allies to join its invading force. This war changes Nausicaä's life forever. The fourth princess of Torumekia and the commander of the Third Army. She is a very competent leader and has the total devotion of her soliders. This does not sit well with her father, King Vu, (she and her father and brothers are in some sort of Shakespearean family dispute filled with hatred, conspiracies, and court intrigues), so she was separated from her army and ordered to take the allied force from the border region, including Nausicaä from the Valley of Wind. She is a strong, but deeply wounded person. Kushana's Chief of Staff. He is a commoner and has his own ambitions, as well as a secret mission from King Vu, but later becomes very loyal to Kushana. His viewpoint as an ordinary man gives the reader a different perspective in this dark and difficult story, as well as some comic relief. The king of Torumekia and Kushana's father. He plays an important role in the end of the manga. The empire on the south side of the Sea of Corruption. Doroks have a totally different culture from Torumekia. The Empire consists of 51 tribal countries, which are ruled by monks. It is now ruled by the two sons of the First Holy Emperor, supported by the Order of Monks. Its capital is Shuwa. "The Emperor, Younger Brother" of Dorok. He has paranormal powers as his father did, and therefore, he is the one who actually rules the Empire. He is a ruthless ruler, and feared by his people. "The Emperor, Older Brother" of Dorok. He doesn't have a mystic power, and had been virtually locked up in the palace for 100 years. Near the end of the story, however, he leaves the capital, Shuwa, and starts taking charge of things. 100 years of boredom seems to have affected his psyche rather badly, and now he wants to have some "excitement", which is a bad news for Nausicaä and everyone else. A monk and the leader of the Mani tribe. Although Nausicaä is an "enemy", he sees the legendary savior, the "Blue Clad One", in her. A girl from the Mani Tribe. She travels with Yupa and Asbel. A little boy who Nausicaä met at a deserted monastery. He has very strong paranormal powers, and uses the powers for Nausicaä. He also seems to have a secret background. The Commander of the Dorok Army. He is very loyal to Miralupa, and fears that Nausicaä might be the "Blue Clad One", who is supposed to destroy Miralupa and the Dorok Empire. After meeting Nausicaä in person, Charuka convinced himself that Nausicaä is not an enemy of the empire. He is a fair and practical person, and cooperates with Nausicaä to save his people. An industrial city whose inhabitants made their living by digging up ancient engines and selling them. One day, a live God Warrior was accidentally found underground. Because of it, the city was invaded by the Kushana's army, even though Pejite was an ally of Torumekia. Rastel's twin brother. He is the sole survivor of Pejite, and deeply hates Kushana and Torumekians. He is a very good pilot and a mechanic. He was rescued by Nausicaä at the bottom of the Sea of Corruption, and witnessed the secret of the Sea of Corruption with Nausicaä. He goes on to the journey, sometimes with Nausicaä, sometimes separately. The princess of Pejite Royal family. She and others fled Pejite when it was invaded by Kushana's army, but the refugee ship crashed in the Valley of Wind, and she died in the arms of Nausicaä. Before she died, she entrusted to Nausicaä a "secret stone", which seems to have something to do with the God Warrior found in Pejite. A vast toxic forest of giant fungi, created after the "Seven Days of Fire". Populated by giant insects, the forest produces miasma (gas), which is deadly to humans. Without a filtering mask the miasma can corrupt human lungs in a matter of minutes. The Sea of Corruption is ever expanding and threatens to swallow all the remaining land occupied by humans. Kings of the giant insects. The protector and master of the Sea of Corruption. They are huge and have 14 blue eyes, which change into red when angered. They are highly intelligent and can communicate with Nausicaä. Feared by many, loved by Nausicaä. The people who chose to abandon fire in order to coexist with the Sea of Corruption. They live deep in the forest, wearing the membranes of insects, eating their eggs, and using their fluid as foam to make their tents. They are considered to be "noble", and feared and awed by Wormhandlers. A boy of Forest People. He has "the same gaze as Nausicaä", and the same kind of power. He and Nausicaä can communicate without a word, over a distance. They share the secrets of the world between them. The people who live in the Sea of Corruption. They use small insects for search and rescue operation in the forest, and make their living from it. They can be hired by anyone for a price. They are treated as pariahs, looked down upon and hated by everyone. However, they turn out to play an important part near the end of the story. The guardian of the secret garden which Nausicaä finds on the way to Shuwa. He (?) tries to persuade Nausicaä to discontinue her journey. The secret he reveals to Nausicaä totally changes the course of the story. Bioengineered Giants who brought the total destruction of the world in the "Seven Days of Fire". It was believed that all the God Warriors died then and were fossilized by the time of Nausicaä, but the discovery of a live God Warrior under Pejite has changed the course of history. This particular God Warrior holds the key to the end of the story.